Raxco PerfectSpeed PC Optimizer is a state-of-the-art suite of tools that provide a comprehensive solution for improving your computer's health by optimizing your drive using PerfectSpeed PC Optimizer's patented SMARTPlacement technology, SafeCleaning your computer's registry, reclaiming disk space by deleting temporary files/duplicate files, erasing traces of personal information, and tweaking Windows for faster performance and better security. Is your PC slow? Is your privacy protected? This powerful suite of tools makes your PC faster, cleaner, and better protected ? from the most trusted name in Microsoft? Certified disk defragmentation technology, PerfectDisk?.
? Completely automated using AutoPilot Scheduling?
? Drive Optimization - Defragments files and consolidates free space to improve drive performance.
? Registry Cleaning - Safely deletes invalid registry keys.
? Reclaims Free Space - Deletes temporary files, web browser cache and identifies duplicate files.
? Erase All Traces - Secures your computer by removing information stored about you.
? Tweaking your Computer - Improves your Windows experience and helps secure your computer. Windows creates fragmentation ? that?s a fact. The more fragmentation your PC has, the slower it performs. PerfectSpeed?s Microsoft Certified defrag engine is the fastest and most efficient method to optimize your PC, resulting in performance gains of up to 300%. You determine exactly when you want the defrag process to start. Daily, weekly, screen saver mode, the process is completely customizable. Or let StealthPatrol? take over by automatically running only when your PC is idle. A clean registry is essential for a trouble free PC and ensures that your high performance standards are maintained. The registry holds key information about your PC and as you install and remove programs, it collects redundant and unwanted debris that degrades performance and leaves it vulnerable to malware designed to infiltrate a computer. Unlike conventional registry cleaners, that can cause system instability by taking an overaggressive approach, PerfectSpeed?s SafeClean technology takes the safe and tactical approach. Finally, you can clean and repair your registry with confidence. Right now, your PC is storing private information that malicious eyes can see. Like it or not, you?re leaving a trail of all websites, images, videos, uploads and downloads and routine activities, such as personal website browsing and online banking, is exposing you to potentially embarrassing or vulnerable situations. What?s more, file clutter, from unwanted cookies and internet file caches, are also leaving a history of your internet activity. Manually deleting these files, and clearing your browsers history, isn?t nearly enough to fully protect your privacy. PerfectSpeed automatically erases these traces forever to ensure your privacy is protected. Don?t waste time using multiple programs that you have to remember to manually run. You also get a military-strength file shredder that permanently deletes files so snoops and criminals can?t recover the data, even if they have forensic data recovery tools. Removing unnecessary duplicate and temp files, is the easiest way to reclaim valuable disk space. Space-consuming music, video, and picture files, that you?ve probably downloaded too many times, are just sitting there wasting space. This file clutter not only brings you closer to running out of disk space, but it?s also slowing down routine applications such as defragmentation and virus scans. PerfectSpeed quickly finds duplicate files and lets you choose which ones you want to keep and which ones you want removed. 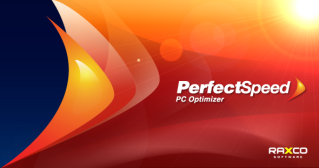 PerfectSpeed PC Optimizer ensures that your Windows Vista, Windows XP Home/Professional, Windows 7 and Windows 2000 Professional systems maintain the best performance possible.